The PlayMyAd Bar & Restaurant network keeps the drinks flowing with interactive content that is designed to get viewers looking at the screen in a relaxed environment where they will be more receptive to your ad. On screen mini-trivia games and polling provide increased opportunities for audience engagement in these popular hangout spots. Get your ad seen and have it become a regular in the local social scene. Does PlayMyAd Inc. Offer a Bars and Restaurants Network? Yes! The PlayMyAd Inc. bar and restaurant network can keep the drinks flowing with interactive content that is designed to target viewers in a relaxed environment where they will be more receptive to your ad. Our interactive ads appear on screen with mini-trivia games and polling. These interactive features will provide increased opportunities for the audience to engage in while at these popular hangout spots. You can have your ad seen and have it become a regular on the local social scene with PlayMyAd Inc.’s extensive networks. What Are the Benefits of Using the PlayMyAd Bars and Restaurants Network? Our research has shown that the calculated average viewers per location are 13,000 per month, while the frequency of ads appearing is every 15 minutes. This ensures that your ad is seen multiple times at all hours and by a range of individuals. When you choose PlayMyAd Inc.’s bars and restaurants network, we can ensure that your message will reach a specific population that will be receptive to it. 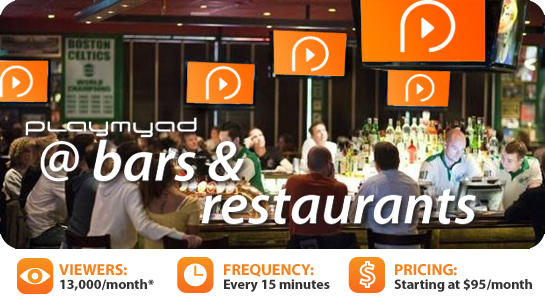 What Types of Businesses Can Benefit from the PlayMyAd Bars and Restaurants Network? Call the team at PlayMyAd Inc. today and speak with one of our marketing consultants at 888-411-6923 and see the amazing results of a local targeted ad campaign! Why Should I Consider Location-Based TV Advertising Over More Traditional Advertising Methods? Location-based TV advertising displays commercials for local businesses on LCD or plasma TV screens in venues that are occupied by targeted consumer audiences. Unlike a traditional commercial, our range of specialty ads are displayed outside of the home. 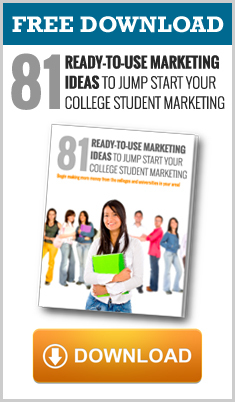 This makes it much easier to target and actually reach today’s on-the-go consumer. Instead of focusing on a traditional commercial that will be quickly aired between TV shows, consider gearing your advertising campaigns to venues where your specific target audience is more likely to see it. Unlike other more traditional forms of advertising, location-based TV advertising will allow you to affordably target your particular consumer audience. These individuals will be interested in your products and/or services. For example, if you own a stylish clothing store, you should target your advertising to the urban and hip population who frequent the local social scene at bars and restaurants. When you advertise in bars or advertise in restaurants you are far more likely to target individuals interested in your product. Traditional advertising options include the use of billboards and TV commercials. These traditional advertising methods can be extremely expensive and difficult to target towards a set group of consumers. However, location-based TV advertising can deliver even better results than these tried traditional methods. Our location-based TV advertising can offer the effectiveness of billboards with the engagement of TV. Local advertising has quickly emerged as one of the most effective means of marketing. In fact, Fortune 500 companies have been using this type of advertising for some time. 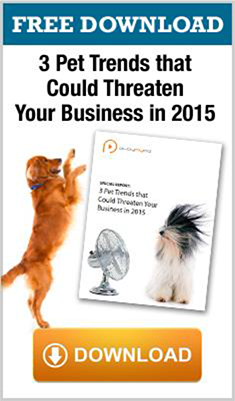 Unfortunately, very few small businesses have taken advantage of this type of advertising. Do not stay in the advertising Stone Age. Instead, get and stay ahead of your competition by taking advantage of our reliable and proven advertising services! The team of advertising experts at PlayMyAd Inc. are here to answer any questions and get you started with your advertising campaign today!